Considered to be one of the main movies of the 1940’s, if not of all time. 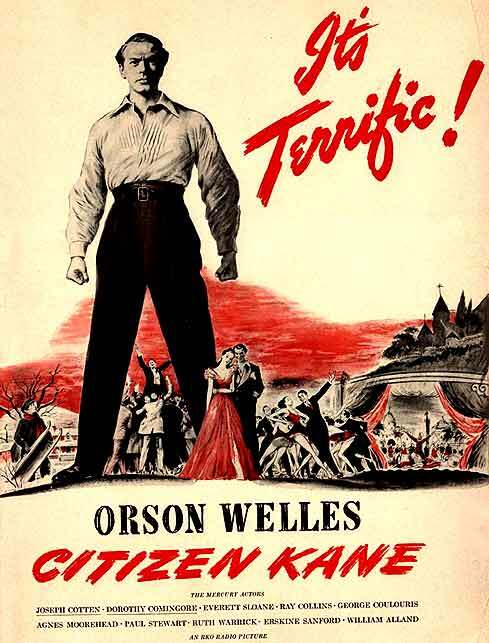 “Citizen Kane” is an American Drama, directed by Orson Welles. He basically did everything in this film- he wrote, produced, directed and starred in the leading role. He was balling the ballers. 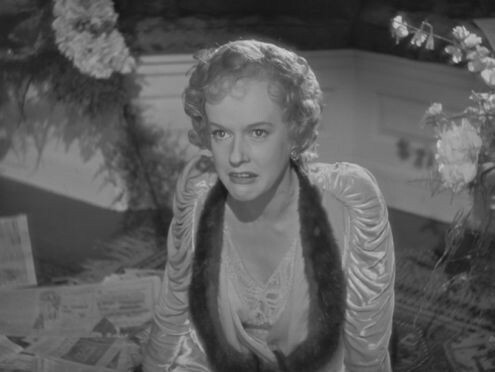 The film focuses on the leading character of Charles Foster Kane, who is this ridiculously rich man, he made his money in the News Paper business, but the “I’ll-make-up-lies-to-see-anything-type”. The story is set up by the introduction of a reporter looking to find the real story to Kane’s life and why “rosebud”, were his last words. The reporter, Jerry Thompson starts with interviewing the people closest to him. (with how) Orson Welles wrote the film, you had flashbacks slowly outlining the type of man Charles Kane was. They were in no particular order, but created so you could understand everything is due time. For example. the first person he interviewed, was Kane’s second wife- Susan Alexander. She’s this blonde beauty, who is now an alcoholic and owns her own nightclub. She’s aggressive and doesn’t answer any of Jerry’s questions. As the story continues, you’ll find out what may have lead her to being this mess. She was one of the few who was close to Kane in the days of his empire going downhill. Hoping to figure out more, Jerry moves on to Kane’s guardian- a banker by the name of Walter Parks Thatcher. Thatcher came into Kane’s life when he was a young boy and when his mother found that the family had the third biggest gold mine in the world on her tiny piece of land in Colorado. Prior to that, Kane grew up in poverty. The mother made a deal with Thatcher to take young Kane away to the east coast, so he could be educated and brought up in a different society all together. The scene was pretty dramatic, there was a shack where the family lived and Thatcher was brought outside to see Kane, while he was playing with his favourite little sled. The viewer also guesses that the mother might have sent him away because of how abusive his father was. So the deal would be Thatcher being Kane’s legal guardian until he turns 25, and at which point he will take over this gigantic trust fund. He somehow finds his way into Journalism and that’s what leads the bulk of the story. What’s really interesting, and I think was an interesting theme for the time. Was that Kane’s story revolved around the fact that he was able to use the news papers he owned to greatly manipulate the public’s opinion on a variety of matters. Whether it was the Spanish American War or his Personal political objectives. He was even able to marry the president’s niece, and this just made him an even more influential man in society. But like most of his relationships in this story, they all faded away. His first marriage ended in the fact that he was cheating with Susan Alexander, a singer at the time. It was a pretty dramatic ending, considering that both his wife and his political rival both found out, which brought a not too surprising end to both dreams. His life with Susan wasn’t anything special. He became this mentally abusive character as the years went on. He forced Susan into this embarrassing opera career , which she didn’t have the energy or talent for. She has the try killing herself for Kane to let her stop singing. The years following are years of Kane’s abusive dominance and recluse, spent in this estate Kane called “Xanadu”. Susan eventually leaves him. The film ends with Kane spending his last years in solitude, only interacting with his staff. He dies saying the word “rosebud”, and this snow globe dropping to the ground. And that’s it. People come to pack up his belonging, cataloguing everything he owned on his massive estate. He was blessed to collect anything from precious art to his old family’s belongings. This one scene, of all the what seemed liked his parents belongings, (maybe collected over the years) were just simply thrown into the fire and incinerated. What I really liked about this film, was the fact that Welles was able to define the character of Kane in a relating way. He was able to grow with the character and make the man seem different after certain situations (like how real life people react to how they deal with things; they grow), compared to other films where you might find the character staying static and now growing in any sense. I also thought it was interesting that propaganda was a sub-theme of the film, and that the beginning of the American 40’s, it was something hitting the public pretty hard. It’s was cool to see that there is a film, portraying it in an objective way. Maybe even mocking how the public event reacts to it. 5 Stars. Obviously Renowned for Reasons needed to be Watched.